I mentioned last week at Outside The Mom Box Facebook page that I really appreciated one mom’s observation that living with a two year old is like “living with a bipolar drunken troll”. That so rings true for me. One minute Elisabeth is high as a kite, happy, charming and relaxed. The next minute, I head to the bathroom and suddenly a tidal wave of dismay of such astronomical proportions hits the mood. “No Mama, no peepee!”. Why is me going to the bathroom such a trauma? Such is the brain of a 2 year old apparently. Two weeks ago though, it was me reeling from an extreme high and a bottom down low. Screen time for Elisabeth is limited to watching a video of herself and/or her friends doing something (hunting for eggs at her birthday party or jumping around at The Museum of Life and Science). It’s worked well so far. But it’s almost Christmas and since I have been reading _How The Grinch Stole Christmas_ since mid-July, I figured it was time to dust off my beloved Grinch DVD. No Jim Carrey for me; it’s classic Boris Karloff all the whole way. I asked Elisabeth if she’d like to see the movie of The Grinch. Of course she said “yes”, not knowing what she was agreeing to but tuning into my excitement and the novelty of being able to look at the computer. I hit “play” and started mouthing the words, practically jumping up and down with pleasure. She watched mouth open as the Whos trimmed their trees and the Grinch plotted evil. At one point I started reciting the words aloud, totally unconsciously, and she put a fast stop to that, “No singing Mama,”. I shut up then and watched silently, tapping my foot. My heart sang with pleasure. This was one of those moments that I imagined I would have with my child. She and I curled up to a warm computer watching one of my all-time Christmas movies. It was sweet and wonderful, a Hallmark card ready for printing. The next day we went to Durham Central Park‘s opening of Mt. Merrill. It was rainy so we didn’t walk. I pulled into the parking lot and saw Wool E Bull’s party van. So did Elisabeth. ” Wool E. Bull,” she said. “Yup,” I said. “When you see the Wool E. Moe-Bile, you know Wool E. is close by.” “No Wool E. Bull,” she said. “Oh no, I think he is here,” I said. In hindsight, it seemed so clear we were destined for disaster. I’m always happy to see Wool E. so I didn’t see any red flags. Although I should have. My husband and I were married at the Durham Bulls Athletic Park. Wool E. was a witness at our wedding. He’s practically related to us! To have my own child who has seen Wool E. before be so terrified of him filled me with mixed emotions. 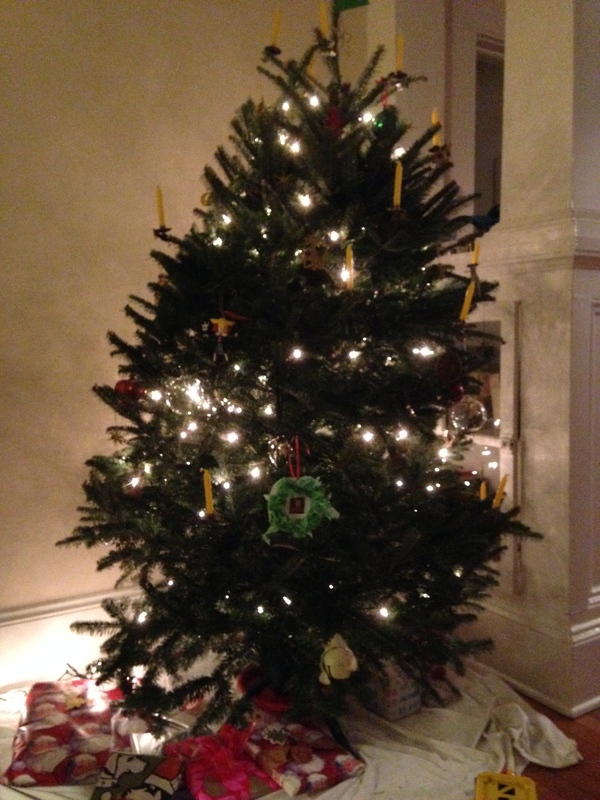 And less than 24 hours after our blissful Grinch experience, no less! Living with a toddler means living with the knowledge that the unexpected is usually what happens. These two experiences reminded me of that. When Elisabeth was a baby I know things were going to change but it was usually predictable change: sleep, nursing, poop, etc. Now as a toddler, things with Elisabeth can change on a dime, in an erratic and seemingly nonsensical way. I guess this is one of the learnings about parenting: the high’s can be so filled with joy but the lows can really be quite low. Here’s hoping your holidays are joyful, merry and filled with lots of bright highs! 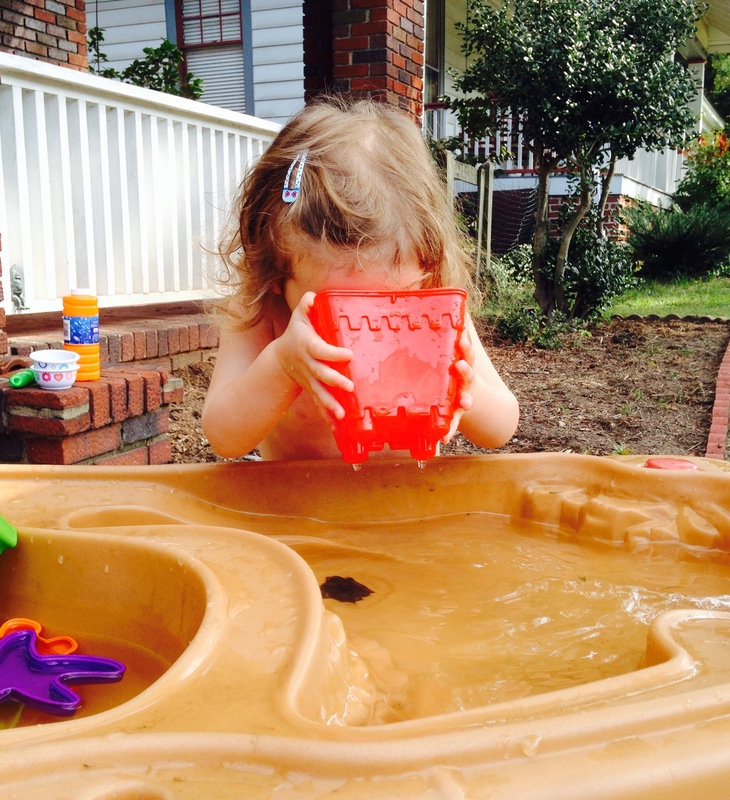 The image above is my daughter drinking from her water table. The good news is that I had *just* filled up the table. The bad news is that she likely would have drank it even if the water wasn’t fresh. In case you were wondering, yes, she’s been drinking bath water too. But I’m not going to sweat it. Perfect isn’t going to happen with me. Rationally I know that I can’t be flawless. But occasionally, and more often than I’d like to admit, I shoot for it. I make an amazing nutritious dinner, vacuum the house and change the dogs’ water during nap. I wash Elisabeth’s hair more than once a week and attempt to comb it immediately afterwards. I wait for my husband to start talking about his day before I dive into mine. Most of this doesn’t last longer than a few days. But I’m not going to aim for perfection or even “excellence” as a mother. Perfection is the enemy of “good enough”. And damn, I want to be a good enough mom before I want perfection…for many reasons, not least of which is good mental health. But I also don’t want my daughter to see a “perfect” mother. Someone who never fails publicly, admits she made mistakes, reverses her position on anything and then wonder why she, aka the star of her mother’s universe, doesn’t measure up. Perfection is the silent killer of trying new things and admitting they didn’t work. And I always want my child to try new things. At 2 years old, she is truly “the girl with small hands and big eyes who never stops asking for more,” and I want that boldness to continue. Perfection will tamp it will down and lock the door. And here’s something else about perfection: even if the attempted pumpkin bread does turn out delicious this time, something else will inevitably happen next time or the time after that to throw a curveball into the batter. Because that’s life. We can’t control everything, even our wishes or our child’s. You can be the mom who dreams of pushing your child on a playground swing only never to do so because he hates it. You can be the parent who does all the research on an issue and your child blows it all out of the water because there is no one else like him in the world. So, what do I do about this silent enemy, perfectionism? I make it up as I go along. I try something new and see if it sticks. I adjust my standards and take a breath. I come to terms with hair washed once a week because that’s who Elisabeth is right now. And unless we have a lice epidemic, why force her to submit to this if I don’t have to? I’m trying to let go of non-essentials, practice gratitude for everything that I have and go to bed early. And when I’m not making it up, I mentally mull over judgement calls all day long about whether or not it’s worth telling my daughter “No!” or cautioning her against something. She who remembers mine and my husband’s words, as your child does too. Is my “no” about me and my perfectionist tendencies or is it really what’s best for her? Most of the time, my “no” seems to be the former. Like when I’m hustling to get her into the car and she’s watching a cat crossing the street. My “no, we don’t have time for that,” is about ME. It’s my fault we are running late because I shouldn’t have tried to make cookies, do another load of laundry, and clean up the toys on the floor before we left the house. That’s the crazy-making and anxiety-inducing behavior behind perfectionism. Every day we are teaching our babies something. And the unreal thing is that it is often invisible. The invisibility factor makes mothering all the harder. So let’s not create more work for ourselves, moms. Let’s give up the pursuit of perfect for good enough, do the best we can, and love everyone around us. About a month ago Elisabeth started rejecting afternoon nap. Since then the precious rest has become arbitrary, like a complimentary dessert at the end of your meal when you hadn’t expected it but had been secretly wishing for a hit of sugar. For me, the parent in charge of naps most days, the wishing for nap hadn’t been secret at all. I’d desperately prayed about it, wrote to list serves about it, listened attentively to wise “older” parents and discussed (ranted) with frie nds and sisters. I don’t think any parent would disagree that the afternoon nap is Sacred. No bonbons and soap operas but time that the stay-at-home parent desperately needs. Like most other parents home during the day, I often work during nap, prep dinner or do minimal cleaning. I. need. that. time. When nap is missing, it feels like my blood pressure is actually rising. I wonder how on earth I can fill the unexpected hours and keep my patience with an overtired 2 year old. Because, make no mistake, Elisabeth is exhausted most days she doesn’t take a nap. She fights sleep sometimes as I used to (still do). There is always one more book to read, another puzzle to figure out. I look at her tight fist rub one sleepy eye and sigh. She is me. To a Tee. Some moms said to me, “go with the flow,” and “if nap doesn’t work one day, try it again another day.” I tried these things. The day Elisabeth said to me, “mama do something else,” before the scheduled nap, I almost started to cry. Mainly because that sentence felt like such a clear wish to be alone but also because she seemed so grown up. But I went away and found something else to do. I soon saw that I can’t count on that however. Heck, sometimes I can’t even get Elisabeth upstairs on her own, let alone in her room quietly working on books. What then? Other moms said that their very verbal kids dropped their nap when they were her age and asked me if she was also very verbal. She is, I said. They looked at me with a knowing, sympathetic glance. I chalked all of this up to “more information can be helpful” category of parenting in my mind and kept praying. I’ve wrote before that I really try and take Elisabeth seriously. I don’t use “no” discriminately and work hard to honor her choices as much as I can, within reason. Now that she is so vocal, it feels even more important to do so. After all, she’s working hard to ask a question or make a clear statement, so it seems like recognizing and responding to that is the least I can do. That’s what I’ve tried to do for nap too. I’ve discovered, however, that approach doesn’t work when Elisabeth is tired. She either doesn’t make good decisions or doesn’t make a decision at all which negates the whole respect thing I’ve been working on. It’s taken a good month but I’ve just realized this. And this realization means I need a new approach to the nap issue. Yesterday I decided after talking with my friend Jennifer on Monday, that Elisabeth and I would come right home from school or wherever, and head upstairs around the usual time. No more play downstairs; we both agreed that the kids just became more wound up and perhaps that was part of the no-nap issue. When Elisabeth and I came home yesterday, we went right upstairs. Immediately, she says, “no nap, not tired.” I explained that she didn’t need to take a nap but it was quiet time and she needed to be in her room. This seemed to go over okay. Soon she wanted to go downstairs and I repeated the quiet time sentence, adding that (cousin) Gigi did quiet time in her house. Invoking (cousins) Gigi or Ivy Jane usually does work but no go this time. Downstairs I could hear the older dog barking his head off outside, wanting to be let in. I told Elisabeth that I needed to him in and I would be back. She started to cry. I closed the door to her room and left. By the time that I opened up the backdoor to let the dog in, I could hear Elisabeth singing. The crying had stopped and she was singing Itsy Bitsy Spider. I debate going back upstairs since I did say that I would go back. I decided against it. Five minutes later, the song stops and it’s quiet. No video monitor so I don’t know what’s going on. The silence continued. I could only assume she fell asleep. A nap had been granted. That was yesterday. Today, I tried something similar. No raucous barking as a means to flee her room but I simply said that it was quiet time and she didn’t have to sleep. I offered Elisabeth’s bear to her. She threw it. I asked her if she wanted to be nakey (a usual sure way to distract and soothe her) and she told me “downstairs two minutes”. Finally, I showed Elisabeth where her water bottle was and left. There was crying. But it was more perfunctory than heartfelt. I lingered in my bedroom for a bit then went downstairs and grabbed my laptop. And here I sit. Windows open, silence on the monitor except for the single fan in Elisabeth’s room. I write. The crying didn’t last for more than a minute and there was no singing today. It’s been almost an hour and I pause periodically to listen hard. Nothing yet. I keep writing. Berry picking is one of those summertime adventures that I always intend to get around to but seldom do. It’s like golf in my mind: beautiful, peaceful but good lord, it takes a stack of time. And I’ve had more excuses the past few summers: being attached to a newborn and then seven weeks away. The summer of 2014 holds much more promise and this June I stead my intention to pluck some blueberries as if it were the only item on my to-do list. 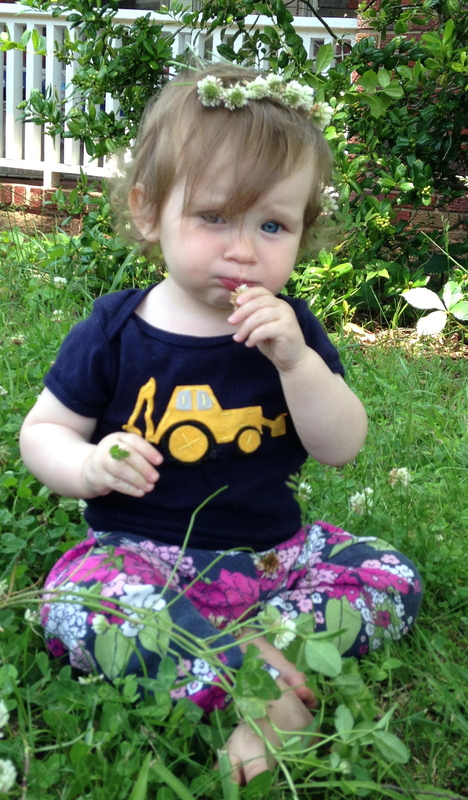 As usual, I would have a certain blueberry-lovin’ toddler along for the ride. We invited a few friends and set out Tuesday morning for Architectural Trees in Bahama. They open at 8:00 but that felt early even though I knew that it would be a hot day so we settled on 8:45. By the time that Elisabeth and I arrived, it was hot but there was a strong breeze. We met John the owner and he explained everything to us (have you ever tickled a blueberry before??). I opted for only one bucket (how much could I really pick myself?) and after washing our hands we set out. Even though John had told us to go a little further out, I didn’t listen and instead just turned right up the second row. The blueberries were small, perfect and tasty. 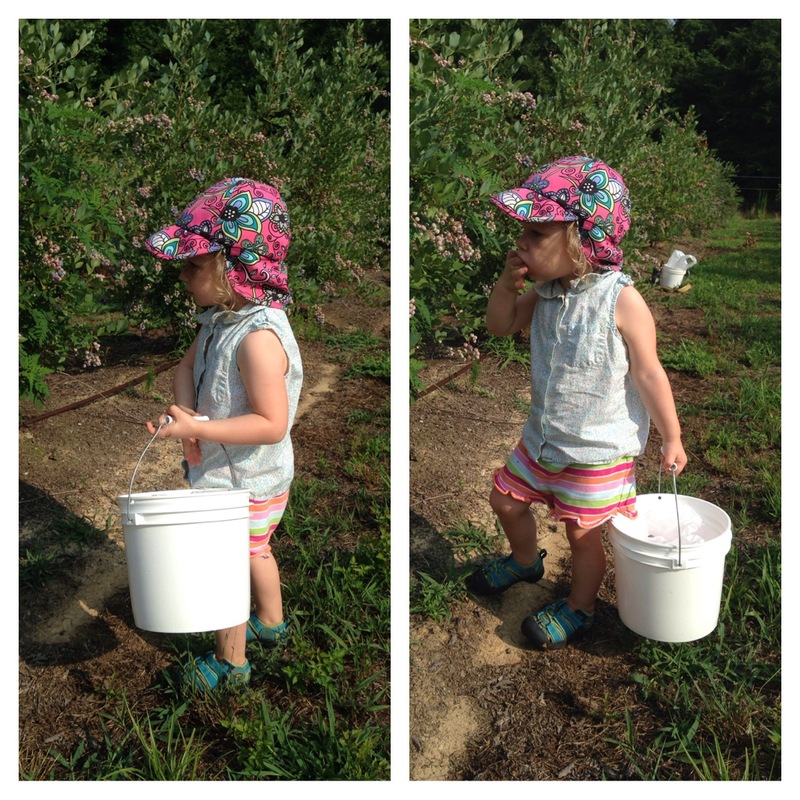 Elisabeth dug right in, just like one of her favorite books, Blueberries for Sal, while I kept picking and plunking the berries into my bucket. There were blueberries, sure, and they tasted terrific but the bushes were definitely looking a bit picked over so I decided we should venture a little further up. We headed up four rows and struck gold. Each bush seemed to be waiting for us. Clusters of berries on every branch, eight thick. We were in heaven. Right around this time, we had a few friends join us and I noticed that my bucket was almost full. I couldn’t believe it! You never know quite how things are going to go with a toddler along on a new adventure so I hadn’t been overly ambitious. But Elisabeth was a trooper. We were both getting a little hot and the breeze had definitely died down but we were both hanging in there. The little sprinkler “outlets” every once in a while provided a cool distraction which was a fun plus. Another bucket was procured. We set out again. But we were slowing. Elisabeth was wanting to be held, a sure sign that she was tired and bored. She was also sticky hot. Somehow that bucket was filled just as we were about on empty. 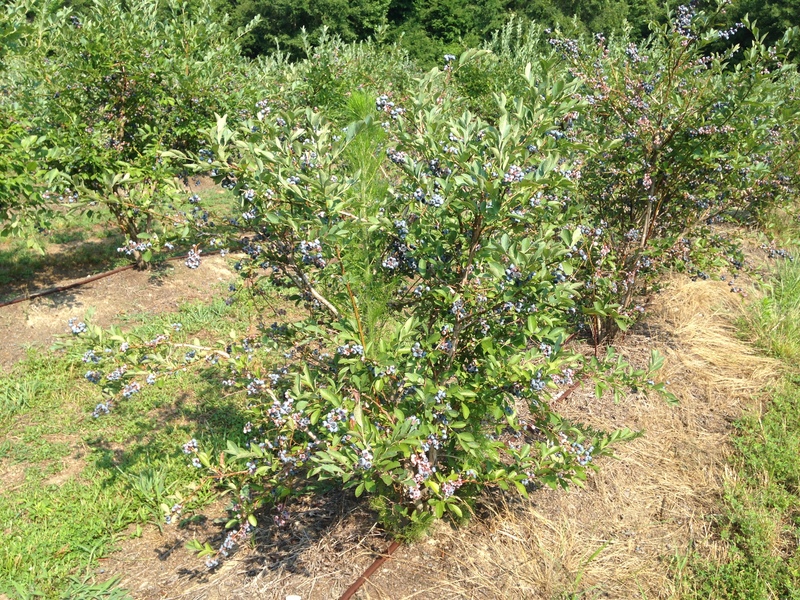 We’d been in the blueberry patch for almost 90 minutes so I chalked that up as a success. When we cashed out ($3/lb..what a deal!) I’d spent all but 75cents of the cash that I had on hand. [Cash or check only for blueberries.] 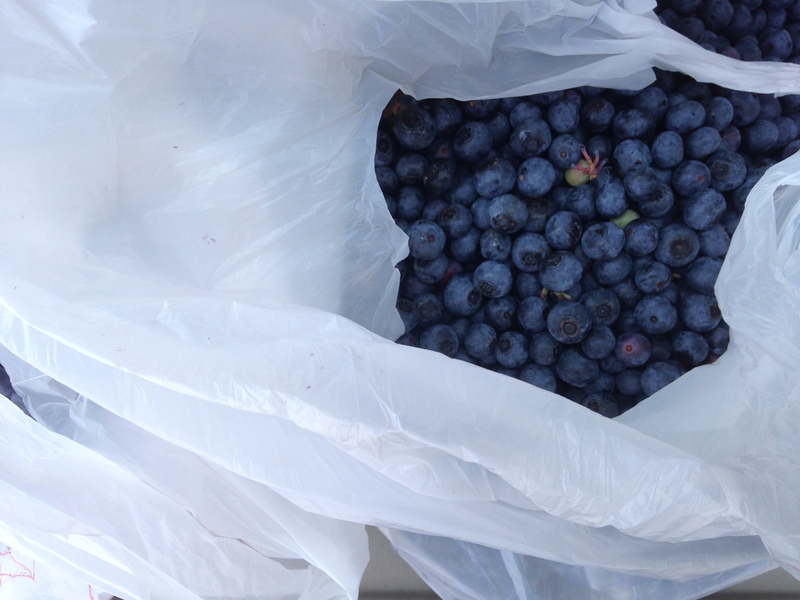 I lugged a toddler, her backpack, water bottle and almost 8 pounds of blueberries back to the car…slowly. We said goodbye to some friends and stripped down. Well, one of us did. I brought a thin dress for Elisabeth to change into (carefully packed in a Ziploc bag underneath the ice in our cooler, an idea inspired by one of my favorite movies, The Seven Year Itch) along with fresh water and ice for her Camelbak and a semi-frozen YoToddler squeezie. I loaded the car back up again cranked on the a/c and took a few last pictures. <—– One of my bags of blueberries. A few green ones got in there! More and more I realize that I just never know how something is going to work with Elisabeth but if I really want to do it, we should try it and see what happens. I know sometimes Elisabeth gets excited for an adventure because I get excited for an adventure! And while I may be hesitant to actually make the adventure happen because there are so many things that could go wrong or feel frustrating, if it feels important to me, I need to try it. Next on this summer “try it” list is taking the train from Durham to Raleigh for the morning at Marbles! Who’s with us? Something Every Parent Needs to Read. Something Every Parent Needs to Read..
via Something Every Parent Needs to Read..
One of the most difficult things that I have had to learn as a parent is to allow Elisabeth to direct our play*. I see a lot of parents struggle with this: the letting go of their child so that she can do her own thing. It is so hard. But in my continued reading of family therapist Jesper Juul’s inspired book _The Competent Child_, I’ve learned that it is absolutely essential to allow our child to exercise free will. 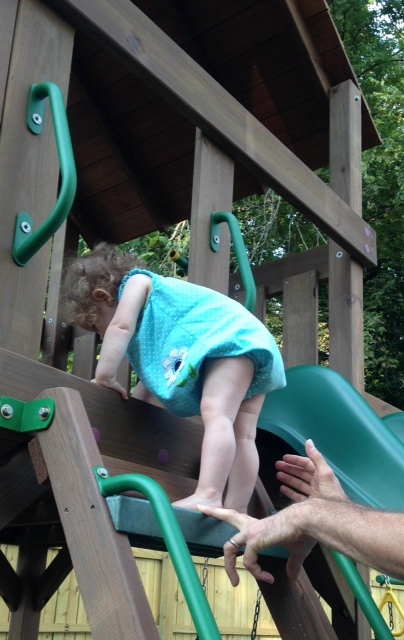 For me, allowing your child to exercise free will starts with taking her seriously. Which sounds a little wacky, I know It’s easy to not take a child seriously. They are small, not as strong as an adult and sometimes can’t even verbalize their own wants and needs. But really aren’t these are all the more reasons why we need to take our children seriously? It’s all too easy to just pick him up and move him where you want to, right? When you take your child seriously, though, you try to understand “the situation” from their perspective and value what they are doing or trying to do. So, in Music Together class for example, I can go get Elisabeth when she wanders off toward the bathroom instead of playing with her maraca OR I can allow her to do that, just sit there and notice what she is doing. So, reason #1 to not pick up your child and just move them: it’s not sustainable long-term. At some point they will be large enough to fight you or at least make moving them physically difficult and likely embarrassing for both of you. But perhaps most importantly, reason #2 why moving them isn’t the best action to take is that when you allow your child the freedom to make their own choices, you teach them that their own wants/needs/feelings/experiences are valid. In doing so, you show your child that you take them seriously. When I think about what I want my daughter to know above else, I come back to one key point. One of which is that she will always know that she is important: that she counts. Even if I or someone else doesn’t like her ideas or agree with her words. Even if she speaks loudly or doesn’t talk at all. She counts, no matter what. Her feelings are valid. And I can say “you can do anything you set your mind to,” (as my mother told me) or “you never have to compromise your beliefs,” or “no matter what, I’ll always love you,” but if my actions don’t back up those laudable statements, then what good are they? And, yes, she’s a little young to hear those exact words right now but she hears other reassuring words that validate her sense of self so it’s still important to back those words up with actions. There’s also an usually invisible pleasure to be found in allowing child-directed play in that we give ourself “the bloom of the present moment,”. I love that quote and found it while reading Christian McEwen’s _World Enough and Time_. McEwen talks about time with children as a way to slow ourselves down and be guided more by fascination, as children are, than schedules. It’s a lovely sentiment. Fortunately it’s one that those of us who have small children can actually dip into when we allow child-directed play. I am one of the most impatient people that I know and that absolutely carries over into my parenting although I work really hard to tamp it. So, I often find it difficult to just allow Elisabeth to do whatever her big heart desires. What that often looks like in real time is much back and forth of her handing off puzzle pieces and me reading each one aloud. As always (or so it seems), this is exactly where I think we’re supposed to be. Me helping the learning instead of directing it. What do you think? Do you allow child-directed play and if so, what does this look like on a daily basis as a parent? Yesterday, after almost seven weeks away from home, I realized with a mixture of excitement but also not a small bit of sadness that Elisabeth is becoming a child. I have called her a “baby” for over a year now and I’m resisting letting that noun that has become a constant for me for so long go away. Even as I type this, I feel a little teary. But there’s no getting around it, Elisabeth is growing up. A mixture of so many things are making me realize this. Of course it’s obvious markers of age: the clothes that we brought with us suddenly look faded and small. And her precious REI cap with the flaps that she’s worn since she was almost five months old is now a bit too tight. But there are subtle changes too. Elisabeth’s interests are different. The swings at the local playground don’t seem to fascinate her as much as they did initially. And this was one of my recent lightbulb moment that she was moving from a baby into a child. I popped her into one but Elisabeth wanted to explore in the sand, get feet and hands wet in the faux brook that kids can create with a hand pump. She wasn’t drawn to these things before. Getting her feet and hands gritty with sand is suddenly appealing to her. Elisabeth has always wanted to interact with other children, as long as they are her age or older. She LOVES children and always wants to be involved in their play. But now Elisabeth tries to communicate with them as well. She touches them and “talks” and sometimes they talk back. This fascinates and delights her. It is so easy sometimes to make a baby child happy. Set this one down amidst other kids and she joins right in the secret game. The play in our small vacation apartment is more sophisticated too. Elisabeth put Mr. Fox in and out of a bedside table drawer twenty times yesterday. In and out. In and out. Then she added diapes, puzzle pieces and DB Dino. Finally bored, she scooted away, onto the next thing. We also played a “shell game” of sorts with me “hiding” a small plastic piece in one hand and Elisabeth trying to guess which hand it was in. She laughed so hard, delighted, even when she was wrong. The biggest change, of course, has been her guided walking with me. We started in the wading pool at the thermal baths. Elisabeth is so tall that I almost don’t have to bend over when I hold her hands. She walked across the pool, stopped when she dropped her cup, picked it up and then we walked back. The following day we walked right out of the pool, toward out blanket and the grass. I think I was holding my breath the whole time. And there are a dozen other small differences too. Elisabeth mimics our faces, “plays” with herself in the full-length mirror, understands the word “gentle”, and seems to say “fish”. What treasures each of these new little successes. 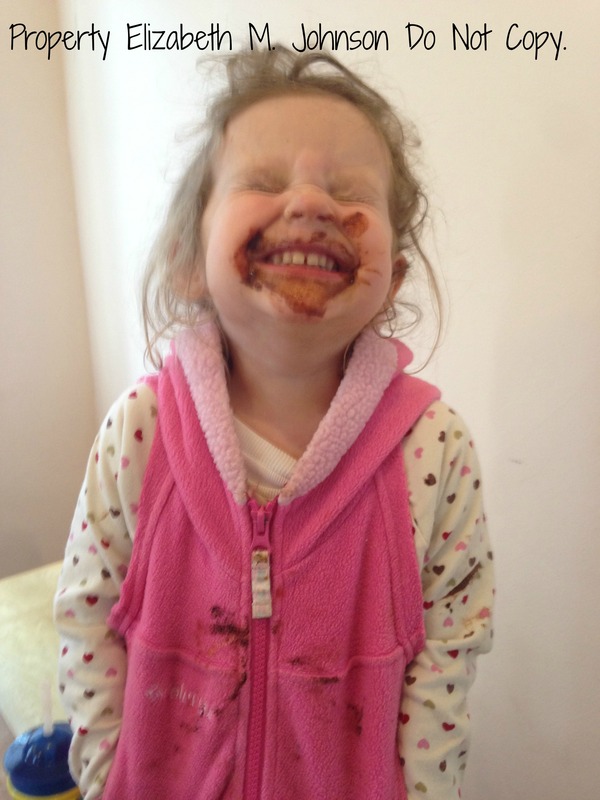 My husband and I watch her, astounded sometimes and what we see her doing on a daily basis. Growing up is so invisible. Somehow I thought it would be more obvious but it seems only to be noticeable if you pay close attention…which I am trying to get better at. And now? She’s napping, in her crib, looking very much like the baby I’ve always known. Of course, it will likely all change tomorrow. The swings once again will be what Elisabeth points to with glee. But maybe not. Two weeks ago, I posted on biting. It was a post that I had tried to write for a while but just kept running out of time and into other issues. However, things have shifted and I’ve noticed/learned a few things recently that I wanted to share. Distractions-I mentioned in my first post that distractions sometimes worked with Elisabeth but I decided to amp things up a bit. Yes, call me crazy but when she asks to nurse and it’s not bedtime or naptime, I give her one of my really cool pens to play with. The cap is screwed on tight but there’s something about the colors, shape and feel of them that she loves so and because her mouth is already full (ha!) I don’t worry about it getting swallowed or bitten. When she’s done, I take it away. WIN! I’ve also been handing Elisabeth off to my husband, especially when I know she’s bored. This has helped “prioritize” the nursing a bit more so no nursing out of boredom or just because a breast is there. These pieces have made a BIG difference. Offering solids– This got away from me a bit in our first week here. I’ve also realized (duh) that Elisabeth only knows to ask to breastfeed when she’s hungry. She doesn’t understand yet that food can come from other places. I started to be more conscious of that fact while also remembering that she is still getting the bulk of her nutrition from me. This juggle in mindfulness has allowed me to relax a bit when it comes to the kinds of foods she eats. I have struggled with wanting to get as many veggies and fruits in her as I can. While that’s still important, I also know that sometimes a croissant in the morning seems to soothe the hunger bit more than a piece of pear. That’s me all over! And Elisabeth will always devour a pear, apple or 6 strawberries over 1/2 a mini croissant so I don’t need to worry as much in this area. Remember those hot days we had in week #2 here? Well, that was also around the time of a lot of biting and nursing. Because breastmilk is 88% water, Elisabeth comes to me to breastfeed because she’s thirsty! Once I “remembered” this, I started to give her water bottle sippy more often. That also helped on the constant demand to nurse and the subsequent bites that came in the process. I’ve always been a bit wary of “too much water” (filling her up but adding no nutritional value, etc.) but Elisabeth is over a year now and she is getting plenty of real food and breastmilk so small amounts of water isn’t a problem. Lastly, it has helped me to remember that breastfeeding is a form of comfort, not just nutrition for Elisabeth. When there is so much upheaval (travel, stress, etc.) she comes to me to nurse because she feels safe there. The breastfeeding has been the constant since minute #2 of her life and it’s what is most familiar. As our days became more routine here, the constant “need” to nurse became less and the biting also subsided. Things don’t ever seem to stay status quo for long with Elisabeth but for now, I’m just feeling grateful for where we are today: no bites & a good size piece of apple devoured.